Dinos are back in War of the Spark. The final battle is upon Ravnica in Magic: The Gathering War of the Spark—and the Selesnya guild just got another boost. Set to release at the end of April, many of the 36 planeswalkers and gods have been beefing up guilds like Dimir and Izzet. With the spoiler release of Huatli’s Raptor, it seems Selesnya has caught another break. Dinosaur decks were big during the Ixlan set, but they haven’t had a huge impact in Ravnica, until now. 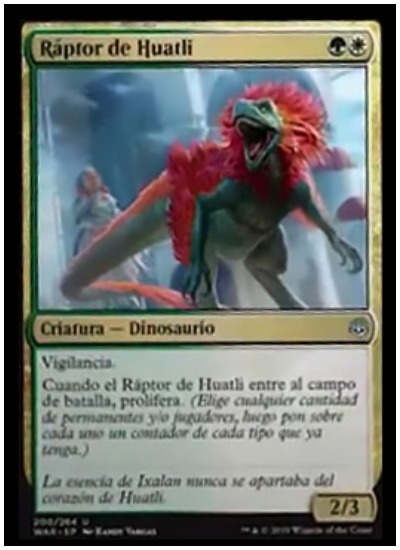 Huatli’s Raptor is a two mana (one white, one green) dinosaur creature with vigilance. The raptor has a power of two and a defense of three. It’s static ability, however, sets it apart from the pack. “When Huatli’s Raptor enters the battlefield, proliferate,” the card reads. Many of the planeswalkers in the War of the Spark expansion don’t have plus one loyalty counters. The newest mechanic, proliferate, allows a player to add counters to any permanent, including loyalty counters on planeswalkers. Playing Huatli’s Raptor and then Ajani, the Greathearted or Teyo, the Sheildmage will spell trouble for an opponent. In addition, beefing up big creatures like God-Eternal Rhonas won’t be good for them either. 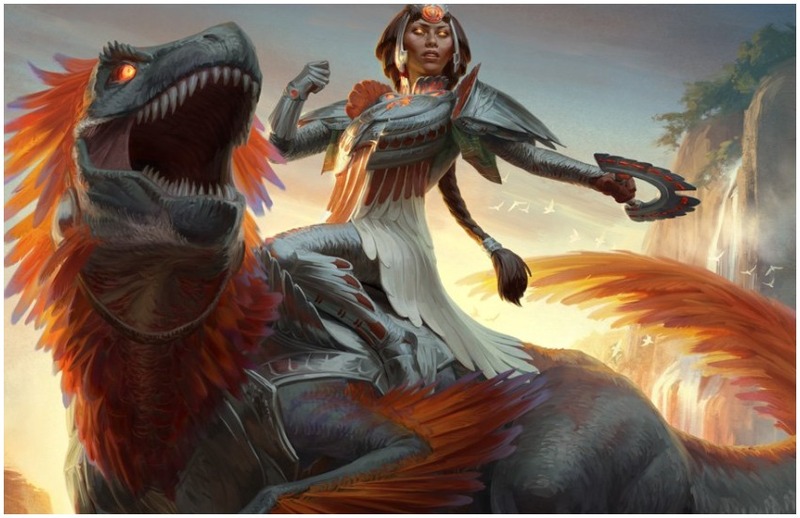 Huatli’s Raptor isn’t a hard card to acquire in MTG Arena since it’s only an uncommon. With a power of two, defense of three, vigilance, and a cost of only two mana, it’s a good bargain in Standard or Limited formats. It’ll also work well in a Super Friends type deck, keeping planeswalkers who aren’t Mythic Rares alive. MTG War of the Spark is set to be released in MTG Arena on April 27. Huatli’s Raptor and over 200 other cards will be available in print on May 3.